and then I said goodbye to our Maasai warrior guard. 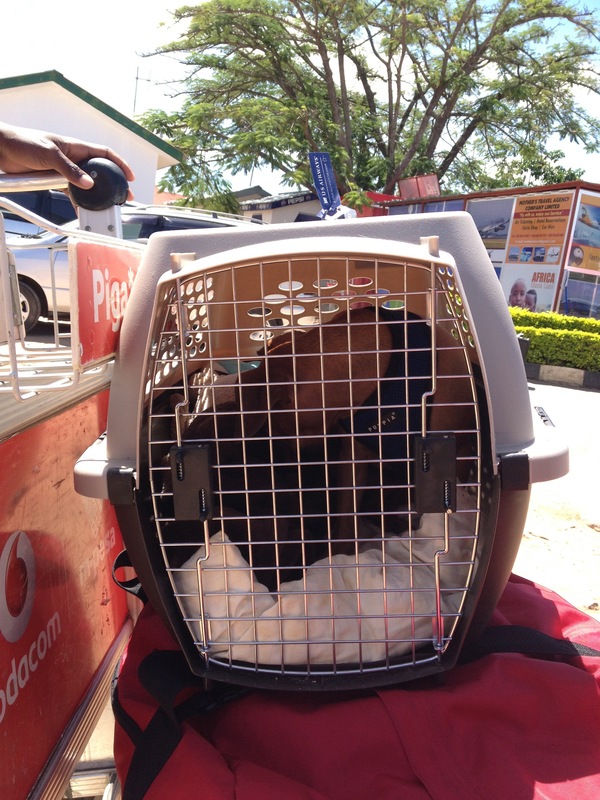 When we got to the airport, mom put me in my cage (which I totally hate, it’s so demeaning) because all the Tanzanians were afraid of me. We went through security and got to the check-in counter with more than enough time to spare. But, unsurprisingly, no one knew quite what to do with me. They said it was impossible for me to fly even though mom had already made arrangements for me with the manager. So I waited patiently (or not so patiently, I’ll admit I cried a bit) while mom fought for my right to board the airplane. Everyone ignored her because they just didn’t want to deal with a situation that made them think outside the box. Eventually, it got too late and the plane simply left without us so we were forced (well, mom was forced, I was happy) to go back to our house for the night. I was ecstatic when we got home and did leaps of joy around the house. You know what was the icing on the cake? When I woke up the next morning, Agatha was there! Hooray! 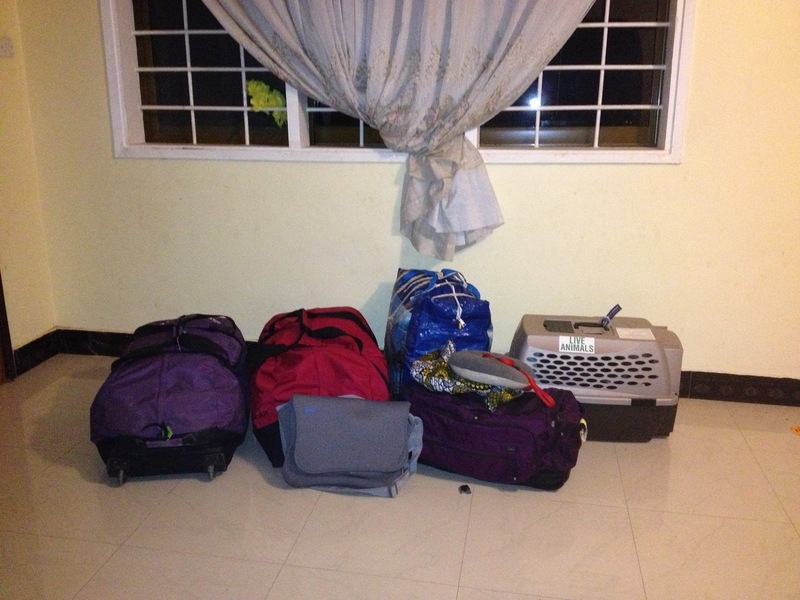 Unfortunately, we really needed to leave on Monday since our flight to Amsterdam was leaving that evening from Dar es Salaam. So, around noon, I said my goodbyes to everyone again. 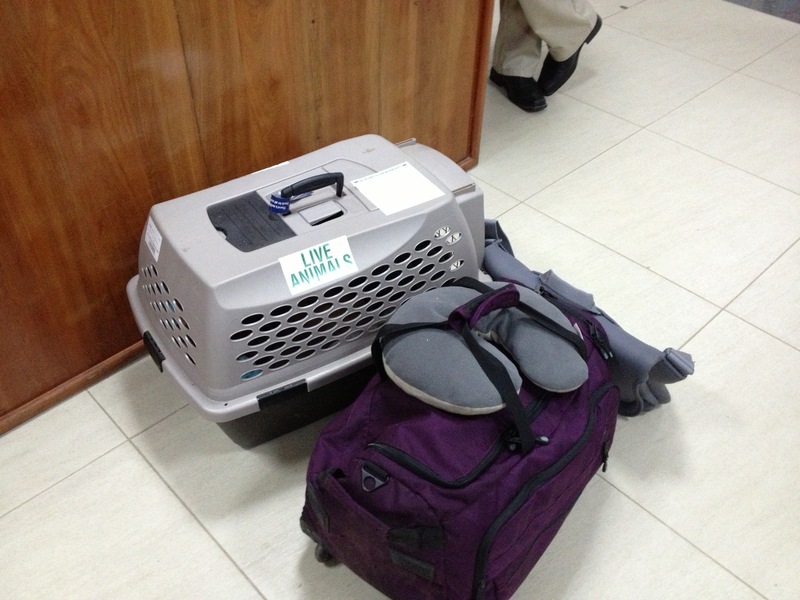 Once more, we arrived at the Mwanza airport and into my cage I went. This time, the people at the airport were prepared for me and things went much more smoothly. 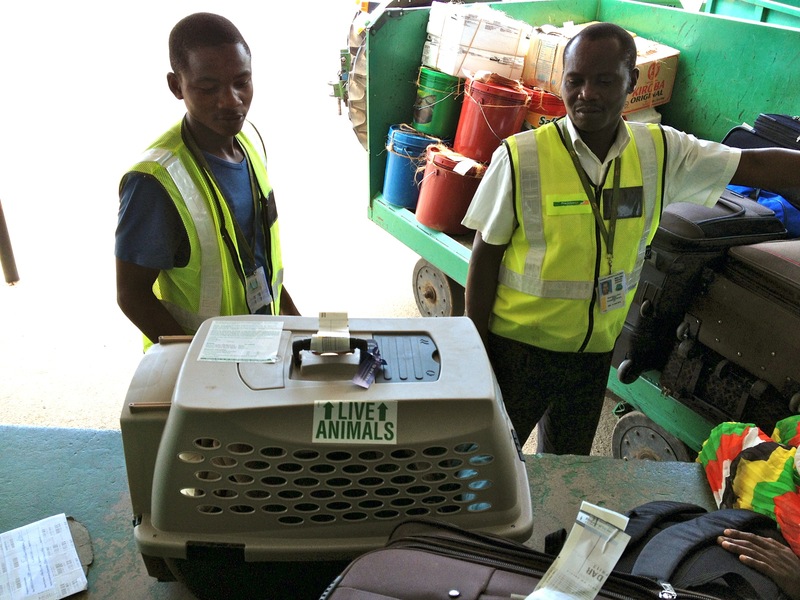 Mom handed me off to the Tanzanian baggage handlers to be loaded into the luggage part of the plane. I was not super excited about this, but since I was in my cage there really wasn’t much to be done about the situation. 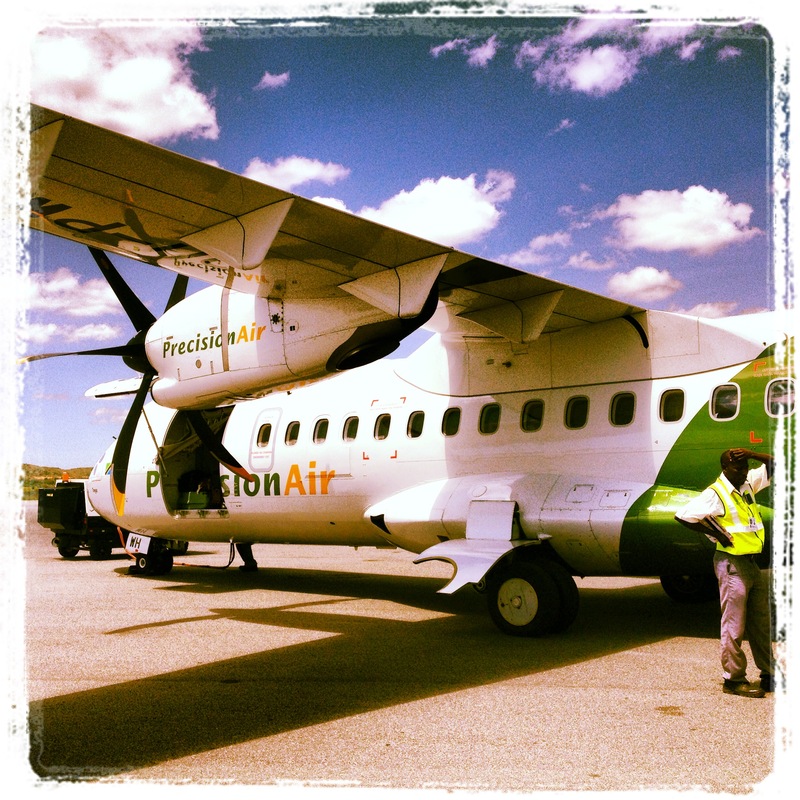 I was driven out to the airplane on a tractor (without my mom) and loaded onto the little ATR airplane, since all of Precision Air’s Boeings are not working. You know where they put me? In the baggage section like I was nothing special. 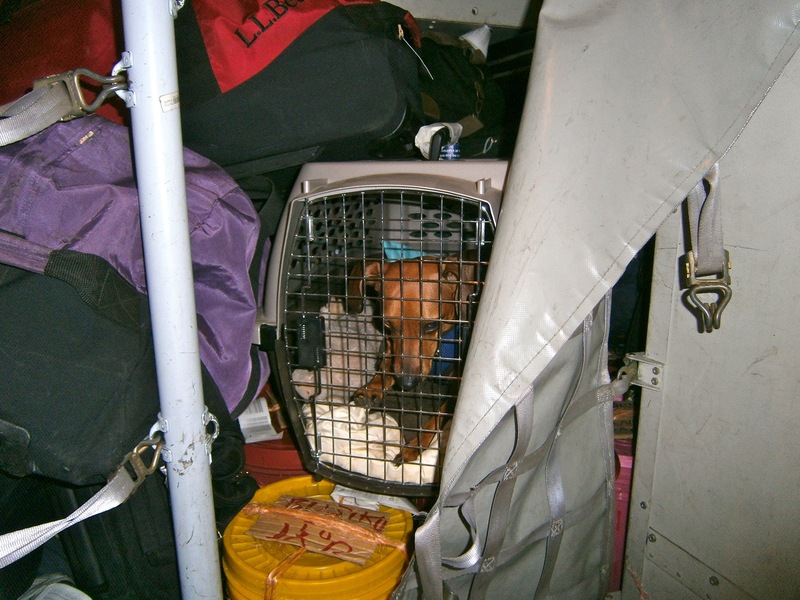 Below me there was a bucket of dead fish that I had to smell for the entire flight and above me was one of mom’s massive bags. I’m lucky that I even survived! Finally, after an agonizing two hours, we arrived in Dar and reunited with mom’s taxi driver friend Sham. Since no hotels would allow us to enter, Sham took us to a place called Coco Beach to pass the time until our next flight. 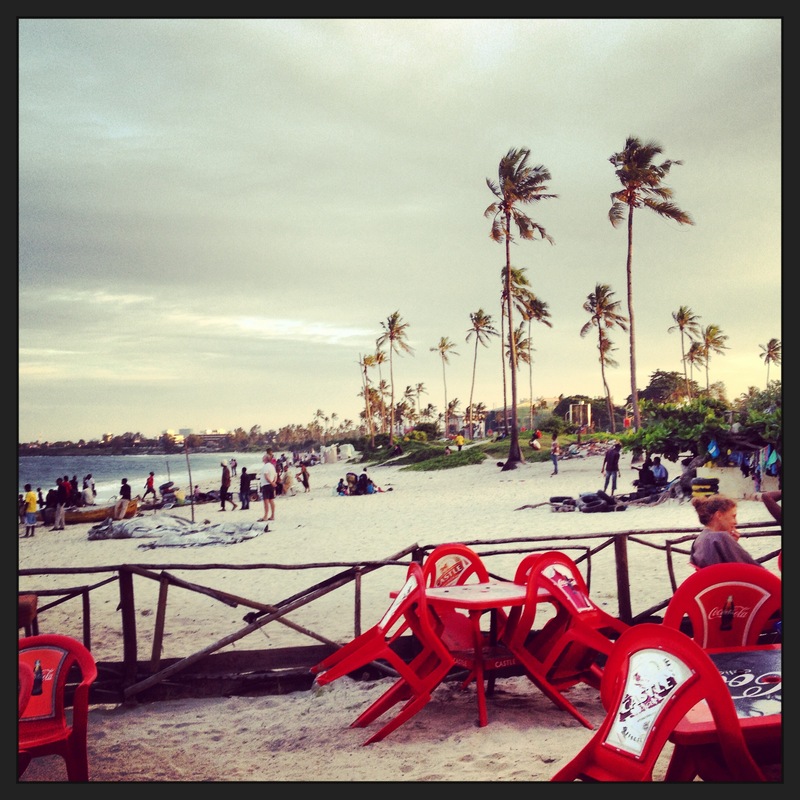 Here’s where I spent my very last hours in Tanzania, not too shabby if you ask me! But, as I’ve learned in my short life, all good things much come to an end. So, after the sun had set, mom and I headed back to the airport to continue our marathon journey back to America. Remember when I told you about my little licking problem? Well, it hasn’t gotten better, in fact the other day it started bleeding and I got my blood all over mom. 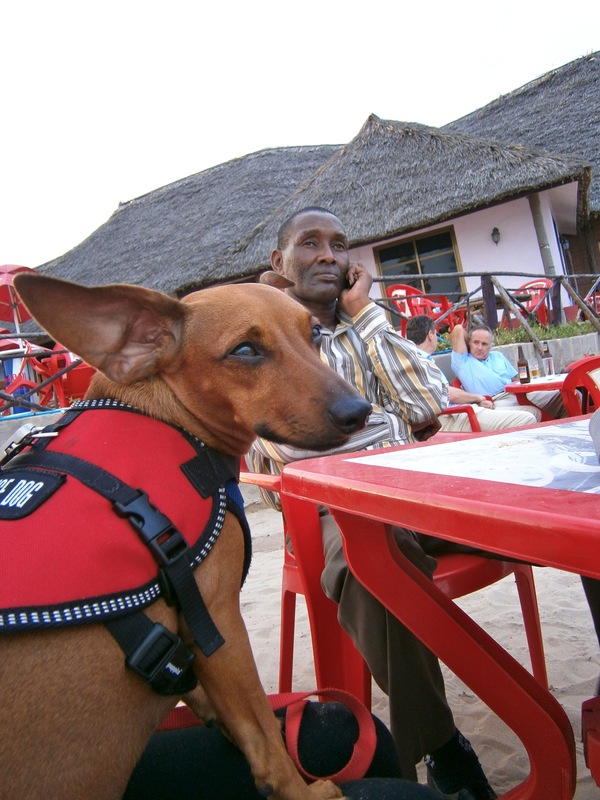 So, she decided it was time to call the Tanzanian veterinarian. His name is Jovi and he was recommended to my mom by one of her friends. Jovi is a veterinarian who makes house calls, which is not very common in the US. Back in Ithaca, my mom always had to make an appointment and then we would go to a special building to see the veterinarian. However, in Tanzania, like most other things, it’s different. Here, my mom just called the veterinarian and in a few hours he showed up at the house on a piki-piki. 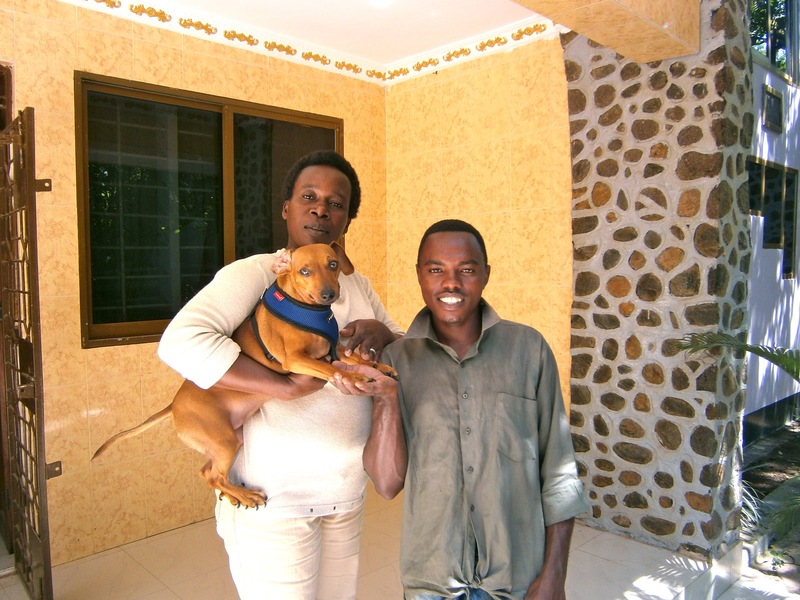 The veterinarian wasn’t like the ones I’ve seen in the US, in fact he seemed intimidated by me, just like all the other Tanzanians. 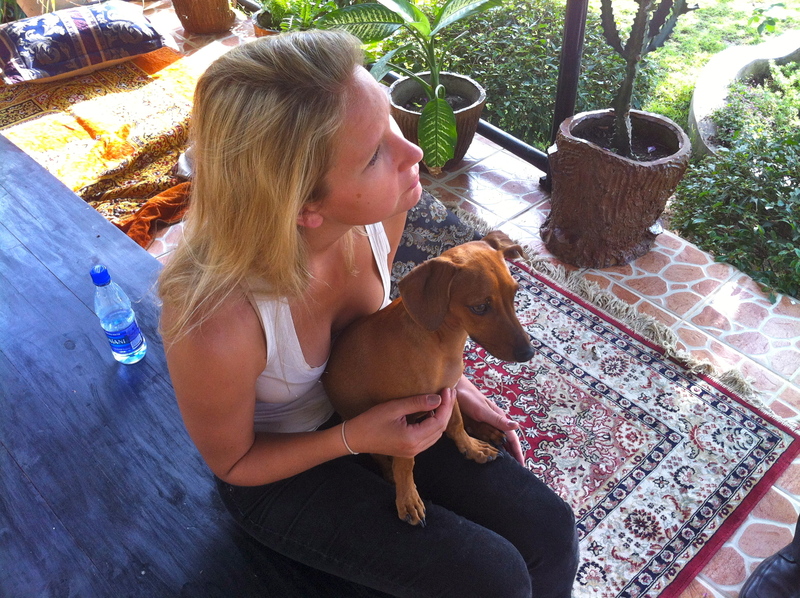 I wonder how someone decides to become a veterinarian in Tanzania, since the love for animals is very different here. Anyhow, he examined my paw, and said that I was strange because normally the licking behavior is on the front paws. But, like my mom, I’m not surprised that I’m unique! The vet also said that it appeared that I had a bit of mange on my skin and that might be the cause of the itching that makes me lick all the time. The vet decided that he would give me a shot of antibiotics so that my paw wouldn’t get infected. He had come with an envelop that contained several drugs and a needle, so he pulled out the things he needed and then asked mom if she had a rope. Mom seemed confused by this request and asked him why he needed a rope. He said that it was to put in my mouth so that I wouldn’t bite him. I couldn’t believe this! In the US, they usually give me a stick with cheese on it and I don’t even notice that I’m getting a shot. Tanzania is like the 1800’s when they made people chew on a stick during surgery! Well, mom said that I don’t bite and that she would just hold me while I got the shot. The vet was still very nervous, and this made me more nervous too. I wriggled around trying to get away because the last thing I wanted was a nervous person coming at me with a sharp object. The vet was not happy with my behavior, so he grabbed the skin on the back of my neck, lifted me up, and stabbed the needle into me. Both mom and I squealed out of discomfort! But soon enough it was over, and I survived. 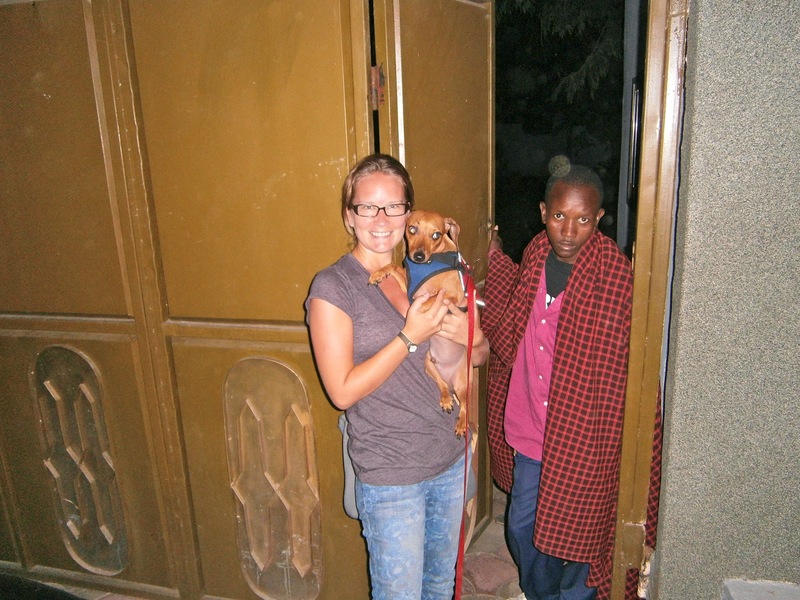 After giving the instructions, we arranged to meet the vet the next day to continue my treatment. 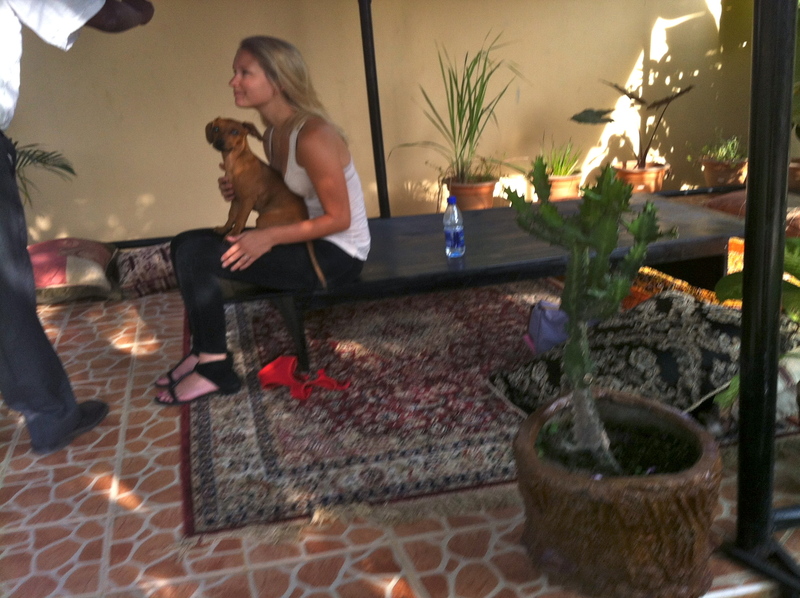 As he was leaving, the vet petted me in the funny Tanzanian tapping way, not the soft American way. In the evening, mom and I relaxed after our stressful afternoon. I think my vet appointment was almost as difficult for mom as it was for me!